Thank you for looking at our site and please visit us again soon. Dragging your mouse over the navigation buttons above will navigate you about the site. 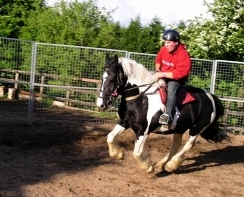 Hartsop Farm is an equine training centre specialising in starting and retraining horses. In addition the centre also plays host to the majority of the courses run by Kelly Marks and the Intelligent Horsemanship Association. 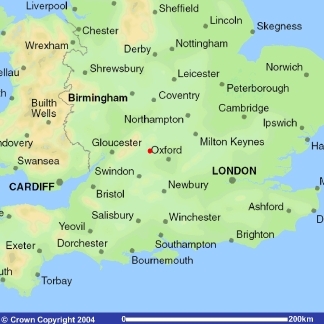 The Farm is located just north of the historic Oxfordshire market town of Witney (Home of the famous 'Witney blanket'). 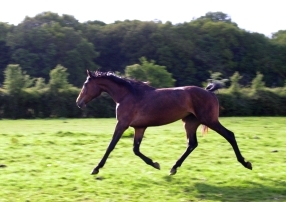 If you are interested in sending your horse to Hartsop Farm or would like more information please contact us. At the Junction of the A34 and A40 (just West of Oxford), join the A40 westbound (signposted Cheltenham). After approximately 9 miles the road becomes dual carriageway. After approximately 1/4 mile on the dual carriageway take the B4022 exit (signposted- Witney East). Follow the road down the hill straight through a set of traffic lights. At the bottom of the hill you will come to a small double roundabout. Continue on the B4022 (now signposted Charlbury). To do this take the 1st exit off the first roundabout on to the second roundabout and take the 2nd exit off the second roundabout. After 500yrds turn right (2nd exit) at the next small roundabout. Continue on the B4022 out of Witney and through the village of Hailey. On leaving Hailey you will pass a de-restriction sign. From this sign it is 6/10 mile to the 'Bird in Hand' pub (on the right). Hartsop farm is on the left 8/10 mile after the 'Bird in Hand' pub. The Farm entrance is marked by two rows of conifers and the gate, bearing the name 'Hartsop Farm', is set back from the road with sufficient space to pull a horsebox or trailer off the road prior to opening the gate. Travelling East on the A40 toward Oxford, exit the A40 at the Junction with the A415 at Witney. At the end of the exit slip road turn left towards Witney town centre. In little more than 100yrds you will come to set of traffic lights. Get in the right hand lane and turn right at these traffic lights. Continue along this road crossing two small roundabouts. At the T junction turn right at the traffic lights. Continue along this road taking the 2nd exit (straight ahead) at the first roundabout. At the second roundabout take the 1st exit (turn left) heading toward Charlbury on the B4022. 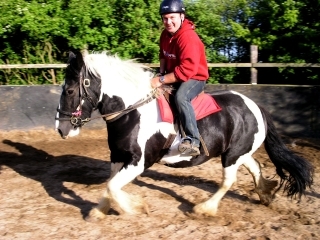 To help promote the fair treatment and better understanding of horses Kelly Marks regularly 'takes to the road' on educational demonstration tours in the UK and around the world. Ian and Grant are key members of the demonstration team but whilst away on tour other staff at Hartsop Farm remain to work with clients horses. There is always something new to see at a demonstration so whether you are a regular attendee or a newcomer wishing to learn more about the philosophy and methods used by Kelly and the team we can thoroughly recommend coming along to a demonstration. 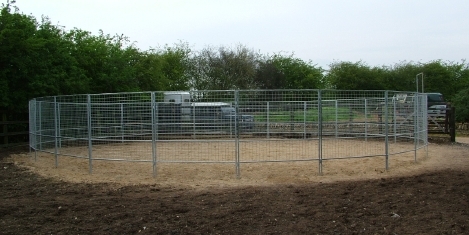 A Round Pen erected on a soft non-slip surface provides a safe working environment for horse and handler. Hartsop Farm can supply Portable Round Pens to order at a very competitive price (please contact us for a quote). Pens may be collected or can be delivered subject to an additional charge. The Pens are constructed of galvanised steel providing many years of maintenance free use. Being portable, each panel is reasonably lightweight and a captive pin system allows quick and easy assembly/disassembly (and there are no loose pins to lose!). For more information or to order a round pen please contact us.